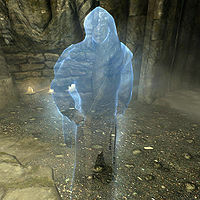 Hafnar Ice-Fist is a Nord ghost who only exists during impressions of past conversations with the Arch-Mage during the quest The Staff of Magnus. He and five other mages from the College of Winterhold, including Savos Aren and the group leader Atmah, explored the ruins of Labyrinthian. The challenge proved too much for them as the mages died one by one until only Atmah, Savos and Hafnar Ice-Fist remained alive. When confronting the final challenge, the dragon priest Morokei, Savos feared for his life and turned on the other two, magically enthralling them to keep the dragon priest contained. The apparition of Savos is later seen mourning his fallen friends and cursing himself for leaving his only friends behind. This page was last modified on 20 March 2013, at 04:49.